Products like Mac and iPad have been designed to be used straight out the box – by you, the educator. Pair this with a solution like Apple School Manager so IT can take care of access and security, plus the Classroom app helps you be more mobile and support learners across your class using a dashboard. From launching apps, websites and textbooks right down to the page, you’ve got a seamless learning experience that will capture the imagination. In education, high quality content can be delivered with technology. This might include equipping students with iPads and apps that provide unlimited online guidance and feedback. Or apps with inbuilt lesson plans to aid teachers. All of this means that if content is being delivered through technology, then teachers have more time to spend 1:1 with their students. They can devote more time to create engaging lessons, lead the right conversations and provide targeted support for students who might be struggling to grasp specific parts of the subject matter. Or provide additional tasks for the students who need further challenging. This ability to scaffold lessons to suit learning needs and styles creates a personalised learning experience for every student. It’s become clear that in order to succeed in life, students need a broader set of social and emotional skills. This covers things like critical thinking, persistence and self-regulation. But teachers often have their hands full just trying to deliver the lesson content and manage the classroom, so that doesn’t leave much time. 1) Devices like iPads and Mac, and apps, can encourage these skills simply by how they’ve been designed for use in classrooms. For example, students working their way through a difficult set of math problems could receive motivational messages as they progress, or messages to promote persistence when they are struggling. 2) Technology can free up time for teachers who would otherwise have to spend it completing administrative tasks. They can then spend the extra time working with students to build crucial social and emotional skills. Using technology-based assessments on students’ Macs or iPads means that teachers can easily identify where they’re struggling. Teachers can intervene with targeted support immediately, before the student falls further behind. They can use the information to tailor their lesson plans and teaching style. A great way for teachers to tailor an immersive learning experience in the classroom is with augmented reality and virtual reality. 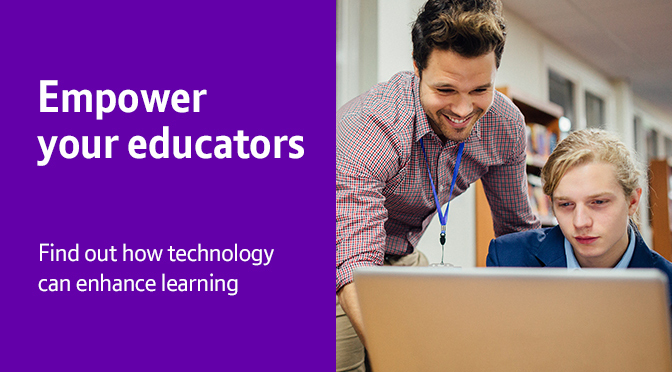 This technology brings your teaching resources to life and lends itself extremely well to subjects like history, geography, science, English and maths. ActiveWorksheets are specialists in providing augmented reality and virtual reality experiences for education. Their resources work seamlessly with iPad. Pupils simply use the relevant ActiveLens app for the subject they’re learning about, hold their devices over their workbooks and sheets, and watch in amazement as they discover 3D models, animation and video. They can also use VR headsets like Google Cardboard to go back in time and explore WW1 trenches or an Iron Age roundhouse. The advance in technology for education has meant that teachers and students all over the world can benefit from personalised teaching and learning. Our solutions can scale to reach many more children at a relatively low cost, regardless of where they are. Programmes like our ComputAbility scheme can provide students with the technology they need to enrich their learning experience, without using the school’s computing budget. ComputAbility is a fully managed, parent partnership programme for 1:1 student devices. Parents support a device purchase for their child through the school and pay for it in bite sized monthly instalments. The device is then the family’s to keep and can be used at school and at home. BT can provide Apple devices to schools with ComputAbility. We can also help to maximise your investment with teacher training via Apple Professional Learning, and protect your investment with a range of cases for iPads.